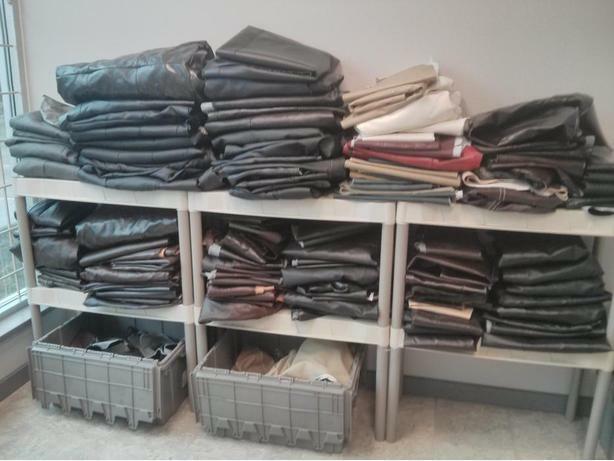 We have assorted bonded leather/pleather/ *fake leather* (assorted color & sizes) reclaimed from furniture we've recycled. Good condition. Lots of it is brand new and sometimes we have pretty large pieces from the backs of sofas, for example. The assortment is always changing and we do not have time to take measurements or look for certain colors, please, come have a look to see if anything will be suitable for your needs. Occasionally, we have real leather as well. Great for crafts (wallets, stool seats, benches, guitar cases, bags, belts, baby booties, puppets, book covers, etc). Please limit your visit to taking 1 or 2 small bags so others have the opportunity to do so as well. Pick up is from Canadian Mattress Recycling in Delta (on Annacis Island) at the north end of the Alex Fraser bridge. Please email to make an appointment time (pickups possible weekdays M-F only between 8:00 am - 4:00 pm, closed stat holidays). Thank you for helping us recycle and for helping charities in need. Check out our website to learn more about us: canadianmattressrecycling.com .